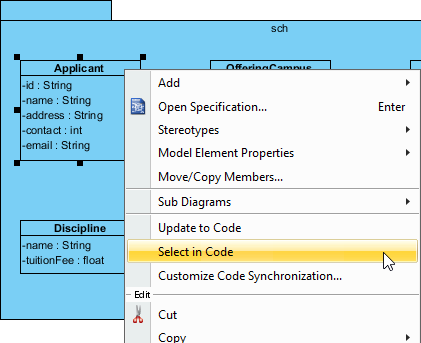 How to Select Source Code in NetBeans from UML? Once a UML class is associated with a Java source by code reversal/generation, you can select from UML class the corresponding Java source file in NetBeans. To open a Java source file from a UML class, right-click on the UML class in Diagram Navigator/Model Explorer/Class Repository or in diagram and select Select in Code from the popup menu. This opens the corresponding source file in code editor. The following resources may help you to learn more about the topic discussed in this page.